What are the Best Binoculars for Cruise Holidays? 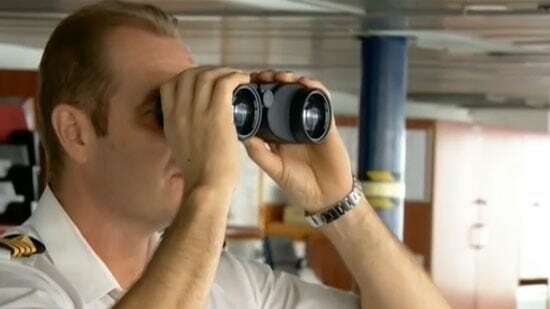 Whilst many cruise ships have a selection of binoculars for you to use, often those available are not the best quality, get a little worn, can have markings on the lenses and you can never be sure that there will be any left if there is an exciting sighting of whales or dolphins for example. It is because of these and indeed a number of other reasons that we will cover below that my suggestion is that if you have the space, get yourself a decent pair of binoculars to take on your cruise ship holiday. Features often found on marine bins like their wide field of view and lower magnification that helps to maintain a more steady view even in rough waters are ideal. But for most people on a holiday cruise, a rangefinder or digital compass may be of interest but not essential and a floating neck strap that keeps them from sinking will be of no use because even if you drop them overboard, I doubt you would be able to convince the captain to turn the ship around to go and find them! Most marine binoculars are also fairly large and heavy, which may not be a problem on board, but if you also plan on taking your bins with you when you go out on day trips then you may be better off with a more versatile pair that is also a little smaller and lighter. A big consideration for most people when going on a traditional holiday or a safari holiday, especially when travelling by air is the size and weight of their gear as it all has to packed away in their luggage. However on a cruise ship things are a little different as you have less size and weight restrictions, plus less worries that your baggage will get damaged en route. However that is not to say that you want to carry too many very large and heavy suitcases onto the boat. Also keep in mind that if you plan on using them when you go on excursions onto land at different locations during your cruise holiday, carrying a large full sized pair along with your camera, map, guide book and other items may not be ideal. The larger the objective lens, the more light your binocular can capture and therefore assuming everything else within the optical system is the same, bins with bigger lenses will produce an image with a higher resolution that is potentially brighter in bad light than smaller ones. However in good light, image brightness and quality will not be a problem even when using small compacts (as long as they are of a good quality). For more on this please see my Complete Guide to the Exit Pupil and this article comparing 8x42 vs 8.5x45 Binoculars both of these articles go into great detail explaining how the objective lens size affects image brightness and quality. Another aspect to keep in mind when deciding what size to get is that larger and slightly heavier bins can be easier to hold onto and tend to resist moving about a little better. This means that they can be easier to hold steady preventing image shake, which can be very important when standing on the deck of a boat or ship in rough water. OR - If size is fairly important, but not critical and image quality, brightness and field of view are important but also not critical then a mid-sized binocular could be the perfect compromise between the two for you. A binocular's field of view (FOV) is essentially a way of describing the width of the image that you see when looking through them and is usually described as a measure at a set distance often at 1000ft or 1000 meters. A wide FOV makes it more easier it is locate and track objects, which can be very important in many situations where what you are looking for is small and fast moving - so birds for example. On a ship it will make it easier for you to locate landmarks, other boats and ships as well as any potential marine animals or even birds. However whilst it is advantageous, I would not say that a really wide FOV is critical. The main problem with high powered binoculars on a ship or on any unsteady/moving platform is that as you increase the power, it becomes harder and harder to keep the image steady as any movement you make is progressively magnified in the view through the binoculars. It is for this reason that most purpose built marine binoculars have a relatively low power of around 7x. If you really want a higher power or if you have unsteady hands, a good option then would be to go for bins that have some sort of image stabilization built within them that can really help. 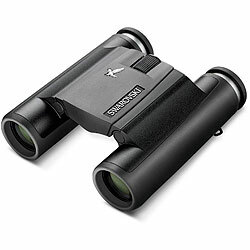 For more, I highly recommend taking a look at the range of Canon Stabilized Binoculars. As you increase the magnification, your FOV decreases (see field of view above). So whilst optics with a powerful magnification enable you to see loads of detail, the narrow FOV makes it harder to locate objects and you see less of the whole picture. With magnification it's not about getting the most powerful pair of binoculars, rather you have to make a compromise between image detail, seeing the whole picture and being able to get a nice steady view of whatever you are looking at. So whilst most dedicated marine binoculars will have fairly low powers of 7x, they are often designed to be used on smaller vessels like yachts that move about more, or by captains in very rough seas. This in my experience and on a cruise ship, you should also be able to get away with magnifications of about 8x to 10x. Roof Prism Advantages: The prism shape means that you can have a smaller more compact roof prism binocular than most porro prisms that have the same size objective lenses. There are also less moving internal parts, so tend to be tougher and longer lasting. Roof Prism Disadvantages: At the cheap end of the market, roof prisms are quite often optically inferior to porro prism's. There are a number of reasons for this which I go into detail in this article: Cheap Binoculars – Is a Roof or Porro Prism Best? Porro Prism Advantages: Their shape means that they often have their objective lenses slightly further apart, which can translate into a better stereoscopic image and a wider field of view than many porro prisms. They are also cheaper to make than roof prisms and so tend to be optically superior in the cheap to mid price ranges. Porro Prism Disadvantages: Can be rather bulky when compared to porro prisms with the same size lenses and are harder to make dust and waterproof and have more moving parts so there is a little more chance of something going wrong. Most people will have a budget in mind on what they feel comfortable to spend on their optics, this will usually relate to your own personal circumstances and how highly you rate the importance of quality versus price. However if you can just take one pice of advice from this page then please try to keep well clear of very cheap binoculars as you will only be getting something that will disappoint and frustrate you and in some cases you will be better off without any bins at all. This also does not mean that you have to spend a massive amount either. 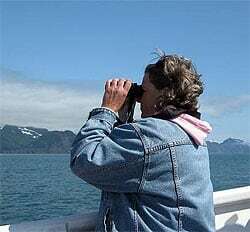 It is true that some of the very best binoculars can be expensive, but there also some really very good optics out there that will not only add to the enjoyment of your cruise, but you can enjoy using them for many, many years. To give you more of an idea, take some time to read some of my reviews on BBR as well as this section on the Best Value For Money Binoculars that I have reviewed in different price categories. 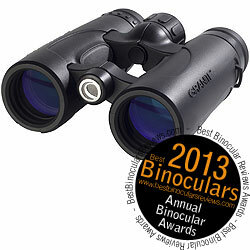 It is obvious that you should look for a binocular that is completely sealed and waterproof. Whilst you may not drop them into the water, you may subject them to rain or spray coming off the sea. The seals will also protect the insides from dust and the dry gas (usually nitrogen) that is used inside them to make them fogproof will also prevent the insides from corrosion, which around the sea can be important. Some bins, especially the higher end ones come with special coatings on the outer lenses that repel water. This is great when using them in light rain or in a spray. These coatings can also make the lenses easier to clean and get water marks off them, which in turn helps them last longer as the glass will need less frequent and less vigorous cleaning. If you wear glasses, make sure you get a pair that has enough eye-relief to enable you to keep your glasses on whilst using the bins and still get the full view without any dark rings forming on the edges. For most eyeglass wearers, this will mean you will need an eye-relief of at least 15mm. 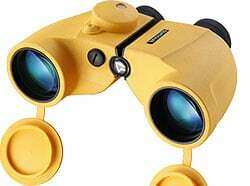 As I mentioned earlier, binoculars specifically designed for marine use tick all the boxes and much more, but they are very specialist and so if you plan on using them on land or taking them on a walk whilst on holiday, you may find many of them a little bulky or cumbersome. However for those who want compass headings, rangefinders and the best binoculars designed specifically for use on the water then this will be the way to go. 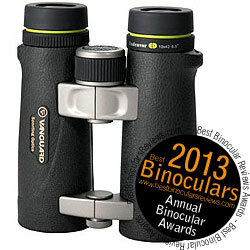 For more on these and for a selection of the best then take a look at my page on marine binoculars. These larger bins will take in more light, producing a better quality image and will perform better in low light, but will take up more space in your luggage and may not be ideal if you decide that you want to take them off the ship when you stop off at any ports on the way on an excursion or day trip.